A clear juice of pomegranate fruit extracted premium variety of Pomegranates and packed hygienically to maintain in natural characteristics. The juice is rich in Vitamins and minerals and gives a healthy and refreshing drink. -, they’d look at you quizzically and ask, "Have you not met Anar "
A clear juice of pomegranate fruit extracted premium variety of pomegranates and packed hygienically to maintain in natural characteristics. The juice is rich in vitamins and minerals and gives a healthy and refreshing drink. 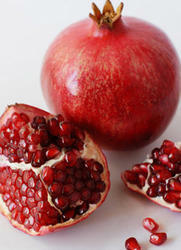 Pomegranate is a thick skinned super seedy fruit, with a brilliant red hue which is now touted as a wonder fruit. Pomegranate juice is made from the fruit of the pomegranate.